GENERAL: The old sidewheel double-ender, MONOCACY, was a part of Commodore Dewey’s Asiatic squadron. Its age and condition required that it be left behind when the remainder of the squadron steamed for the Philippines and destiny. 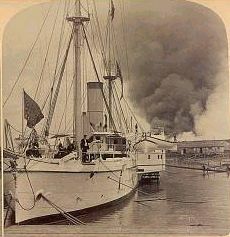 BACKGROUND: The sidewheeler steamer MONOCACY was launched in December, 1864, in the closing months of the United States’ Civil War. She was not completed until late 1865, and not commissioned until 1866. The vessel was immediately assigned to the Asiatic Squadron, where she was destined to serve out her entire, long career. In late 1899, MONOCACY carried the U.S. minister to China to ports along the Yangtze River. The following year the Boxer Rebellion occurred. Though present, MONOCACY would not take part in the naval action against the forts at Taku because of orders from rear Admiral Kempff not to begin a fight with the Chinese. She was however, hit in the battle when a Chinese shell damaged one of her cutters. As war had broken out, Kempff's orders no longer applied and MONOCACY was able to act in concert with the other allied vessels. She remained at Taku until Boxer Rebellion had been concluded in September, 1901. Rudolph was married at the catholic church in Tientsin, China on June 30th, 1900 to Anna Stella Moore. 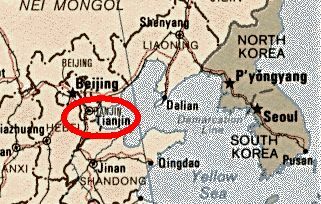 Note: The map gives the name of Tientsin as Tianjin. Tientsin is the old Wade-Giles Chinese translation of the name. Tianjin is the modern Pinyin translation. The Boxer Rebellion was also in 1900 and Marines aboard the USS Monocacy were involved in saving people in Tientsin. There is much more written about this incident on the Internet and in books. Unfortunately we have no record of how this affected Rudolph Martin Tismar and his new wife. He enjoyed training and racing horses. We have pictures of him with his favorite horse, Buster. We have a letter of recommendation dated April 13th, 1933 from the Tientsin Race Club which praises him on his knowledge of raising and training horses. This was signed by 16 members of the club. He worked in the Chinese Maritime Customs after leaving the Marine Corps. His memo of service shows that he worked from March 31, 1898 to February 24th, 1933. At the time of his retirement from the Chinese Maritime Customs, he was the Chief Tidesurveyor and Harbour Master. China was turning to communism during his time in the Chinese Maritime Customs and he slowly started moving his family to the United States. I'm not sure of the order of their movement but I do know my grandmother, Katherine Anna Tismar, and her sister, Dorothy, came to the United States in 1929. I'm assuming he followed shortly after his retirement in 1933.